That was really lovely. You DID create a moment for her, and I’m sure she’ll remember it. Those little times where we deviate from our usual routine can get imprinted in our brains for years to come. Great photo. It really is an amazing thing to see an owl close up. It’s only happened to me once, but I was nowhere near as close as you were. I still hold out hope that we’ll see the one that visits our yard one day. 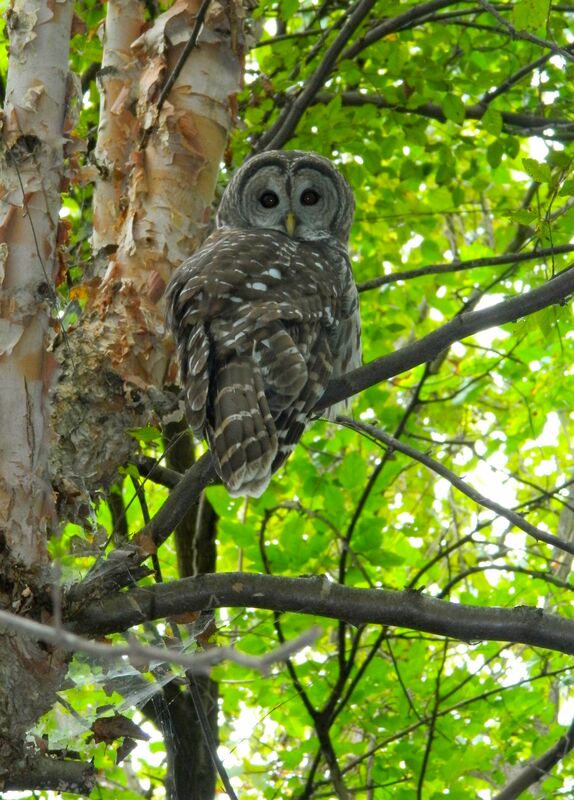 After seeing that Barred Owl, I felt like I’d surely be able to see an outline of an owl in or around our yard. But at night eyes and shadows play tricks. Still, it was fun and different and I’d do it again in a heartbeat. Seeing the one at the park–amazing! Gosh, he was a beauty. He stared at us for a long time. Very nice! Those are the great moments with your kids, even when there’s a different ending! We know it’s the unexpected that brings the best joy as a parent. I could have stayed out there in the cold with her all night. This is so well done – nice moment caught. I don’t think I have ever seen or even heard an owl before. Thanks. You know, I often wonder if my kids will remember things like this and think they are special. I had never seen or heard an owl before either. I wonder if they think it’s just something that happens all the time. Lovely story. How wonderful to see that Barred Owl. We hear owls often here, and looked out of our patio doors one evening to see three Tawny Owls sitting on a branch in our silver birch tree. We believe it was two adult birds and one young. Perhaps Mum and Dad were giving Junior tips on hunting. On our evening walks, we often see a pair of Barn Owls, but whether they are a mating pair is uncertain. On the same length of road there is a pair of screech owls. We are hoping to see young there shortly. Those Barred Owls are amazing. And being in a public garden, they get lots of visitors. I’m surprised they haven’t been scared off by now, especially with crazy people with cameras gawking at them! But how could one pass up that opportunity? I could watch animals all day. Love this story of an unforgettable moment with your child! These snapshots in time are such a gift! Oh Karen! I just love this post, been waiting to know which owl it was. So glad you and your daughter got to share something so special. With raw woods on our property, we are fortunate to have several pairs voicing their disputes. Since we hear them at least weekly, Angie has their call down pat and can do it on command — perfectly. She just added the barred owl to her 2014 birding journal; she has a goal of 100 birds and is already up to 45 or so. I hope you’re hooked and that you WILL do it again. Maybe you’ll even build an owl box. Incidentally, I got video of one in my yard about a year ago (http://wp.me/p28k6D-Wj) with a link to the barred owl call as well (mine was quiet). Makes my hairs prick when we hear them in the middle of the night! I’m still not certain of the identity but that’s the sound of the call that most fits what we hear. And if it’s a Great Horned Owl, well, I would sure love to see it! A birding journal is an excellent idea. My daughter would love that. She has a bird identification book to look at but I don’t think keeps track of what she sees. These birds are indeed huge. 20 years ago, one swooped down and past me because I had startled him. I’ve never forgotten it. I can see why. I don’t doubt I’ll ever forget looking up into that tree and seeing that face staring down at me either! I’m just so glad my friend was able to capture the moment. Beautiful! Just because you haven’t seen one yet doesn’t mean you won’t! Keep owling! I live in a fairly rural area, close to vast parks. The year it was home, I frequently saw them at dusk. But they are incredibly quiet, except when they are hooting. You really can barely hear them when they fly. We never see but frequently hear screech owls. The first time I made my husband go out in the middle of the night to make sure no poor woman was being attacked on our doorstep. Terrible sound! I would love to see one at dusk. When I’m out walking this time of year, I’m always looking up in the trees to see if I can spot one sleeping. I’m surprised I haven’t fallen yet. I have run into a few branches. My kids always hear mourning doves and think those are owls. No screech owls around though. Such a great experience for you both. And very cool that you documented it, MM! Beautifully written, Karen. A couple of months ago, I tried to “save” an owl from the highway because I thought he was injured. I had no idea what I was going to do with him once I got him off the road, but I couldn’t stand the thought of someone hitting him. As soon as I got out of the car, he flew away and landed in a nearby tree. If only I had taken a picture! Funny. How close did he let you get? And that was a beautifully written post! He kept his eye on us. Really I was just afraid he’d try to shoo us away–and maybe not be so kind about it. I have a deep respect (fear of) for large birds. I give them their space. All that flapping wingspan and beak activity–scary business! For sure. When you sneak up on one unexpectedly like that, or maybe he snuck up on us, it sure does give the heart a workout. What a beautiful post. Thank you for sharing! On a trip to Florida last year my husband and I saw a small burrowing owl while on a night walk to the beach. It was magical. I would love to see a large owl of any kind. They are amazing. That’s really how I felt. I just wanted to see any owl. I think living in a neighborhood, I never expected to see as much wildlife as I do. Great story. And great blog. What a beautiful story — and I remember doing similar things with my kids, thinking those same things, hoping they’d never forget the moment, like when we woke up super early on a camping trip to go look for a moose… I love these stories and those moments. Oh, I would love to do that too! We went to Maine this summer and hoped we’d just spot one. Of course we didn’t. I often wonder what my kids will remember. I doubt it will be the same things I do, but I know they’ll have special memories just the same.